Escaping the daily grind has turned into something all creative minds strive for. We want to learn new things, we want to learn about new places, and whether we realize it or not — we want to learn at new places. It’s this sweet spot of being outside of your comfort zone combined with the pleasant feeling of new experiences that will turn a grey daily routine into a colorful bouquet of stories to tell. We all remember our first steps in the classroom as a teacher. The excitement we try to hide when we face the knowledge-hungry students, the first words that these very same students speak, the expectations in their eyes all leave a lasting trace in our lives. If this day hasn’t yet come for you, it is definitely something to look forward to. The feeling of giving to people (and not products) brings such an intense sense of fulfillment. And that’s a feeling very few other things manage to excite. When teaching abroad, though, things are elevated to a whole new level. You will immerse yourself in a country’s culture, gaining knowledge while giving knowledge. What nine to five job can offer you such an opportunity? This great infographic by GoOverseas makes it easy to see that even for volunteer programs, having a meaningful impact is a major factor for such ventures. This cannot be more true for teaching abroad. You will often work with students from different generations, exchanging experiences, seeing them grow both academically and as people. Adding a pinch of multicultural knowledge and social skills will undoubtedly make the world a better place. Teaching people that come from a completely different background is an adventure that will satisfy anybody’s hunger for accomplishment. You will become the master of creativity while creating engaging, informative lessons. There’s really no limit here — you can be as creative as you’ve always dreamed to be. Also visible from GoOverseas’ infographic is that almost a third of volunteers say it’s the traveling and cultural immersion that motivates them to take up volunteer jobs. I’m sure teachers who chose to go abroad feel this factor is all the more motivating, because their expenses are taken care of, leaving more room for personal growth which comes in third. You can experience the exotic culture of Vietnam or the strongly European spirit of Hungary firsthand. The several months you could spend in such exciting countries will recharge your batteries and even help you put things in perspective. The time spent teaching abroad allows for experiencing places that tourists usually miss out on. Just think about a multi-day trek through the lush vegetation of Vietnam, the long walks along the country’s endless beaches, and wandering through its busy cities without the pressure of an impending flight back home. These reasons barely touch the tip of the iceberg, when it comes to the exciting advantages of teaching abroad. The list goes on with the humble building of friendships that could last a lifetime, and even the career-orientated unique work experience you can include on your resume. There’s something for everyone, and that’s the beauty of teaching abroad. It works without concern of age or past experience; it makes you the captain of your own ship. 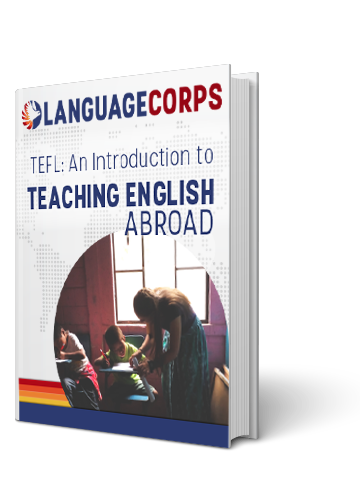 Head over to LanguageCorps and see how we can make this life-time adventure easier for you, and drop us a line in the comments below about what makes you want to teach abroad.